Lions (Venus in Leo) and fishes (Mars in Pisces) may not seem like the most likely match when it comes to love and romance, but this pairing can work if they are game enough to try. Each brings a unique and distinctly different energy to the relationship, which when joined together creates an alchemy all of its own. This couple is a classic case of “opposites attract,” merging fire and water in a potent mix. Venus in Leo roars when she’s having a good time, wanting to share her pleasure with the world. This Venus is anything but shy, enjoying an audience to her unfolding love stories. Generous and warm-hearted, Venus in Leo will do whatever it takes to impress a lover. Her love for drama may sometimes rock the boat in her relationships, but her charisma and good nature are hard to pass up. She loves to receive appreciation for almost anything, but compliment her on her hair if you really want to gain her affection. 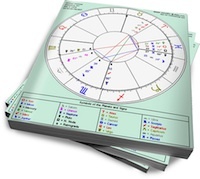 Mars in Pisces is highly sensitive and able to mysteriously intuit just what his partner wants. Though he may assert himself with a certain ambiguity, once he does make a move, expect a blissful merging to unfold. This Pisces picks up on signals that others may miss, making him a gentle and compassionate lover who wants nothing more than to connect at a deep soul level. He is at his boldest and most direct when he feels emotionally understood and connected, as this frees him up to access his innermost self. Venus in Leo warms Mars in Pisces up, helping him to enjoy life and experience his inner child. Mars in Pisces sensitizes Venus in Leo, helping her to get in touch with her own spiritual depths. If the two can accept their innate differences, they have much to learn from each other and have a chance to create a union that merges elemental opposites into a new and creative form. Heh I don’t think I would be keen to try this one if I had foreknowledge, since I have Mars in Pisces and Venus in Taurus. I think it’d be a rather tempestuous (if lusty) and short relationship! Altho it could work if his Venus were at the beginning of Leo since mine’s at the end of Taurus! An out of sign sextile would be spectacular. Now to find this mystery man.